Warning note:: This article was written a long time ago and therefor is based on a really old version of phpMyAdmin. The basic ideas should be the same, but I will still try to update this article within the next week (today is the 22nd of July 2006) to use 2.8.x. Where can I get phpMyAdmin? Backup procedure Note This tutorial is based on phpMyAdmin 2.5.4. The GUI of this tool changes from version to version but the basics have stayed the same for quite some time now. 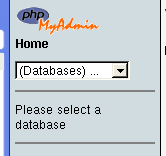 Open phpMyAdmin with your webbrowser and enter your database account data to access your database. 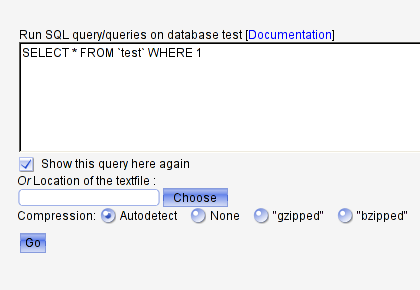 Now you see a multiline selection field where you can select tables to be backed up. If you select no table or all tables then the backup stores the whole database. 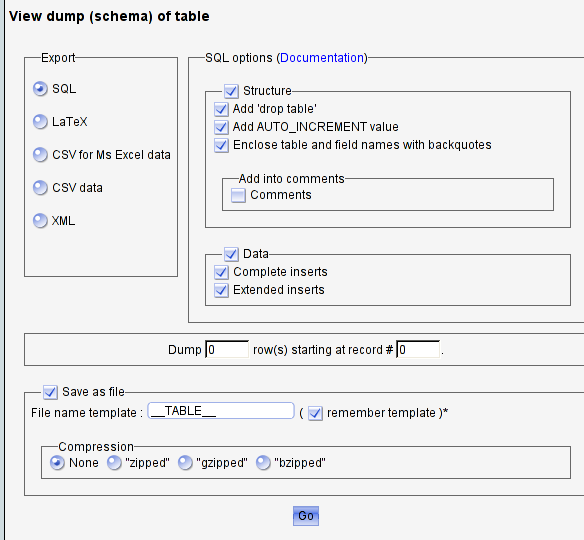 Select on the right side the “Structure” and “Data” option and below the selection field “Add ‘drop table’” , “Complete inserts” , “ Extended inserts” , “ Enclose table and field names with backquotes” and “Save as file”. If you have also “zipped” and “gzipped” there you can get a smaller backup file. In the left field select “SQL” if it’s not already selected. Note: This tutorial is based on phpMyAdmin 2.5.4. The GUI of this tool changes from version to version but the basics have stayed the same for quite some time now. Now you can see a drop down menu in the left frame of phpMyAdmin where you select your database. Below a text field there should be a smaller field with a “Browse…” button on its right side. When you click it appears a file select popup. Here you select your database backup file and finally click on “Go”. Open the backup file in a text editor that supports bigger files. For example VIM. Nearly every line ends with a ;. These are the points where you can split the file. Simply copy/paste everything after a specific ; into another file. Be sure to give those files useful names so that you can insert them in the right order into the database later.